Last year when I decided to spend my study holidays touring around Angkor Wat temple, little did I realize that I would be visiting a place that once enjoyed strong ties with India, especially the ones who ruled the southern part of India. Being my first trip abroad, I wondered how I would be able to adjust in Cambodia, a foreign country that was thousands of miles away from India. But to my astonishment I felt at home. You know what? My guide’s name was Arjun, a common name in India. After exchanging pleasantries, we straight away headed to see the magnificent Angkor Wat. The temple complex was huge and full of legends from popular Indian epics namely Mahabharatha and Ramayana engraved on its walls that extended to nearly 2500 kilometers length. I was told by my guide that the name of the khmer king who built this temple was Suryavarman and originally named the place as Yeshodarapura or Vishnuloka, the dwelling of the Indian god Vishnu who is considered as a the guardian of the universe. To my further astonishment, I was also informed that Suryavarman was a Chola descent who ruled the southern part of India. My inquisitiveness about the Indian link helped me learn various folklores doing rounds in Cambodia and I am very happy to share them with you all. One such folklores mentions that a handsome Indian prince from South had come to Cambodia and married a gorgeous Cambodian Princess to become a Cambodian King while another folklore cites that a Brahmin called Kaudinya defeating a princess of Funan known as Soma of the Naga dynasty and subsequently marrying her to become a Funan King. Though different versions exist, the truth underlying the folklores clearly point towards the introduction of Indian legacy in Cambodian soil. Historical evidences too throw light on an established chief maritime link between India, South East Asia, Africa, Sri Lanka, Rome and China. According to them, gemstones and spices from South East Asia arrived at the Indian East Coast Side of Tamil Nadu and Andhra and from there they were shipped via African Red Sea Ports to reach Rome. The ceramics, ancient Roman coins and other articles found in the Cambodian and Thai region are proof enough to ascertain the trade link. It is also believed that the major Indian ports including Arikamedu, Mahabalipuram and Kaveripoompattinam served as trading links with Cambodia. 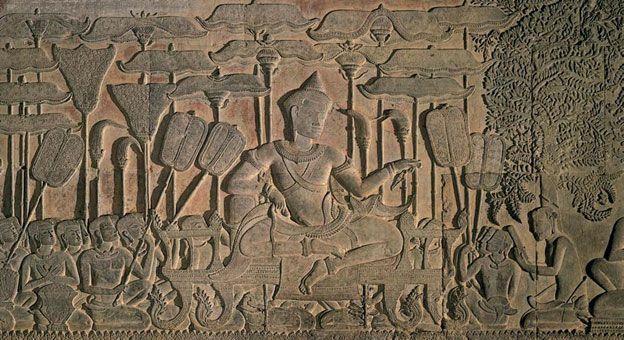 I came to know from books that Cambodian culture and art was prolific with South Indian influence especially during the rule of Cholas between 9 and 13th AD and Pallavas during the 3rd and 9th AD in South India. Cambodian Kings had even adopted the honorific title “Varman” of the pallava rulers and so almost all the Cambodian Kings beginning with Bhadravarman of the 4th AD had the title attached to their names. One of the pallava rulers by the name Nandivarman is belived to have travelled to Kanchipuram of Tamil Nadu, India to ascend the throne of the Pallava Empire after living for a while in Cambodia. Since I have travelled around the nooks and corners of Kanchi Temples in India, I found various features of the Pallavas and Chola architecture resemble in Cambodia too including the pyramid like gopuras with three tiers or levels, towers, entrances and so on. Many even say that the Angkor temple depicts Mount Meru, the sacred Himalayan Mountain considered as the abode of Gods. 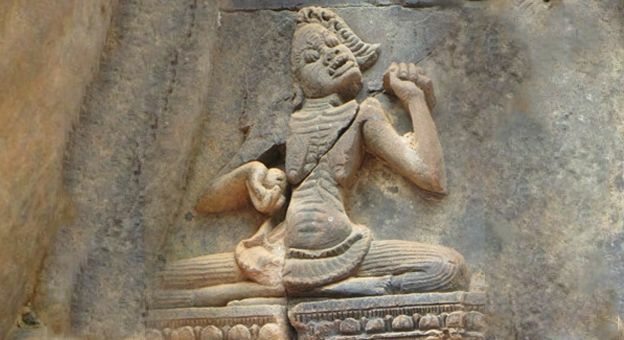 In addition to this, I also saw the Pallava cult of God Vishnu with eight arms also called the Ashtabhuja Vishnu being embraced by the Cambodian king Suryavarman II who built the Angkor Temple. A huge monolithic figure of the same was placed by him in the uppermost tier (sanctum) of the temple which was later moved to the entrance due to the influence of Bhuddhism. 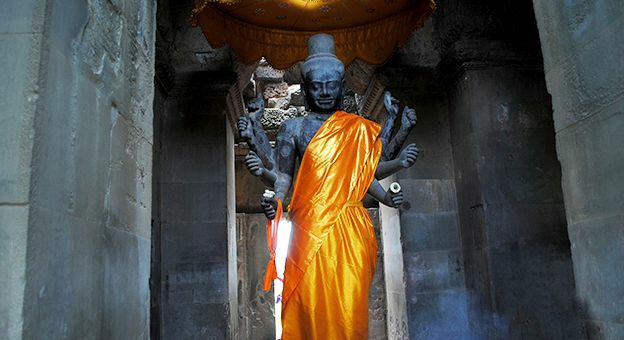 Many archeologists are of the view that the statue found in Angkor is strikingly similar to the one found in the temple town of Kanchipuram, India in the Ashtabhuja Perumal temple. Another familiar thing I found at various places of the Angkor temples was the depiction of the Hindu legend of churning the cosmic ocean that is known to only staunch Hindus of India. Though not known for sure, I heard that the Cambodian king Suryavarman sent a stone block as a gift to the Chola King, Kulottunga I while he was building or enlarging the popular Chidambaram temple of Tamil Nadu which was dedicated to Lord Shiva. Inscription at this temple mentions that the stone from Cambodia was gratefully accepted and installed in the temple. Likewise the breathtaking Banteay Srei temple near Angkor Wat with intricate carvings features a small delicate female figure has been acknowledged as a well known Tamil saint, Karaikkal Ammaiar. Thus my trip not only helped me realize the magnificence of my Indian culture and ideologies but also allowed me to witness them in a larger scale on Cambodian Soil. Cambodia’s Angkor Wat has always fascinated tourists all over the globe for long, but what is more fascinating is its likeliness to India in so many ways. More and more revelations about the similarity in culture, art, architecture, names and various other historical evidences has only increased the curiosity and interest of the global audience.